We are pleased to announce that vessel nr 287, MS Jektøy, was handed over to Boreal Sjø AS on Thursday the 23th of february. The new carbon fibre catamaran is 25m long and has the capacity to carry 147 passengers in a cruising speed of 25 knots. 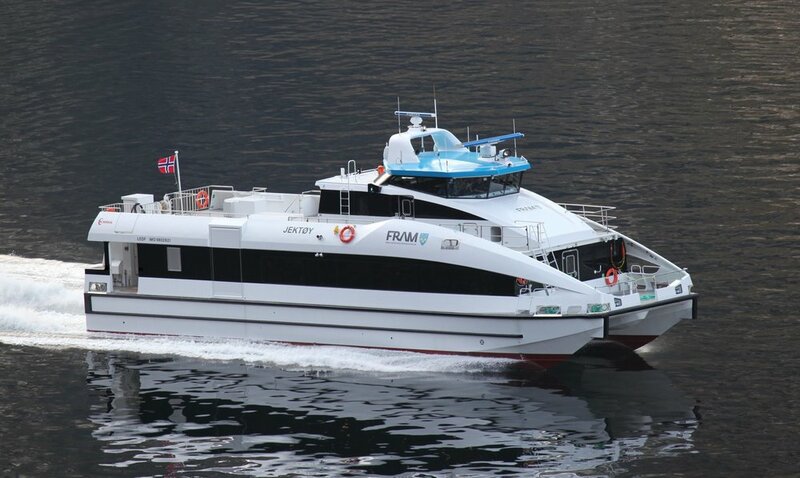 The vessel is built to the IMO HSC 2000 and NMA Fartsområde 4. MS Jektøy is built on our well proven semi-planning hull, used for more than 30 previous deliveries. However, the superstructure is brand new on this vessel. Developed in cooperation with Hareide Design, the lines of the exterior is made in coherense with our new 30- and 40 meter vessel designs, see Valderøy and Jin Zhu Hu. Stationed in the city of Molde, the vessel has already entered into service on the route to Vestnes and Sekken. Passengers can enjoy a spacious salon with low noise levels (65 db on avg.) and comfortable seats from West Mekan. The new build is equipped with 2xMTU 8V2000 M72 engines, each supplying 720kW of power. Reduction gears and CPP propellars are delivered by Servogear, and the evacuation system by Undertun. For more pictures and info, see vessels page here.